Rukeribuga Fidele - Rwanda, Africa - Prayers for emergency relief and in need of many supplies for school as well as needs for Food and Transport vehicles. They need prayer for spiritual, physical and financial aid and help. Shelley - Victoria, BC - Prayer for a touch from Jesus and to have a real life experience in the Lord. To be released from bitterness, anger, resentment, unforgiveness and spiritual poverty and adultery. Prayer for her children that they are not affected by her own spiritual and emotional short-comings. Deliverance from witchcraft, and the desire for power and control. Prayers are greatly needed for this family. Linda - BC - Canada - Prayer from the release of legalistic views and understandings. Prayer to be delivered from oppression and depression, sorrow, loss and grief. Prayer for spiritual understanding and to be grounded in the Liberty (Grace) of our Lord and Savior Jesus the Christ. Prayer for spiritual wisdom knowledge, understanding, strength and with the anointing of Holy Spirit to reveal the Victory in the life of the believing and Spirit-filled Saint. 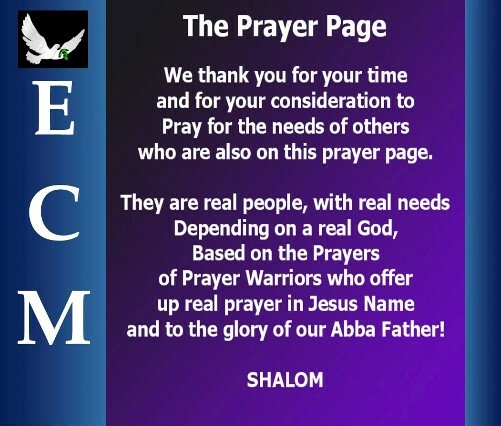 Prayer for healing in Linda's body as she is experiencing health issues of many kinds. Prayer for peace, joy and restoration to be set as a foundation in Linda's personal spiritual life. To Jesus be the glory. John Leeburn - Vancouver, BC Canada - Healing of throat cancer, total restoration and release from cancerous cells in his physical body and all Masonic and every other curse be broken in Jesus Blood and Name. John is a Christian and desires the prayer of the saints for total restoration of body and health. Pam Goodkey - Ontario, Canada - She would like to be released from Alcohol and drug addictions that are bigger then she is and that she would be set free in the name of Jesus and come into relationship filled with intimacy with our heavenly Father and walk a life blessed in Christ Jesus. Prayers are greatly needed for Pam Saints, so praise the name of Jesus. Rivers of Living Water Ministries - India - God's provision, spiritual growth and maturity, and a successful outreach to minister to the people in the area and surrounding areas that the love and grace of Jesus will be known among the nation. To God be the glory. ECM Books - Grace and the legalist mindset and Why would a loving God...Send me to Hell. The success of these evangelical teachings touching the hard hearted, the lost and the seeking. That these books will be used as powerful tools to minister to hearts and souls drawing people into a deeper and more meaningful relationship filled with utmost intimacy with our One and Only Saving Grace. Rev. DR. Mathew Nathaniel - Nellore, Andhra Pradesh, India - We are in Ministry in India. We want double the Spirit of God our Almighty Father for the Ministry. Please pray for the necessities required by and for this ministry. If God's will permits we are going to start one small Bible school, an Orphange and hostel for the children in need regarding this area in India. We feel the call of God for these needs in this area, so please join us in prayer that God will bring it about and this to His glory in Jesus name. Rob and Kassandra Rascilla - Billings, Montana - Prayer for Salvation, healing, family and Righteous morals and family values. Nothing is to big or to hard for the Lord our God to do. Saints let's lift up this young family to the glory of the Lord and see what God can and will do. Jeanette Deleon - Scranton, PA, USA - I was recommended to this site. I need alot of spiritual prayers. I just lost my 24 niece to a brutal, fatal murder. I'm saved just haven't been myself since her tragic death. Really hurting. Please pray for me. Let's join together Saints and ask for the peace of Jesus to touch and move through this entire family. Lionel Mayor - Kubwa, Abuja, Nigeria - I need the Lord to help me fulfill my God given destiny using the God given talents, skills and potential abilities given to me. I require prayer for finances and for the Lord to open doors to go abroad especially to Canada, my dream country to be a blessing to God's people. Alexandra - Krakow, Poland - Alexandra came out of a fire alive, but now has to fight for her life and a normal future. She is 14 months old and she has burnt skin all over her body, damage facial bones (as a result of very high temperature). She does not have half of her face. She is in hospital in Krakow-Poland and one of the best specialist is looking after her. However she still has to go through many surgeries and then long rehab. Unfortunately her parents do not have any more money. Jocelyn Wood - Chetwynd, BC Canada - Jocelyn is having a hard time breathing after heart surgery, would appreciate prayer for her. She is also in an abusive relationship and needs prayer to be delivered from it. Colin Gramm - Langley, BC - Salvation, freedom from alcohol, spiritual knowledge, strength and understanding. Also prayer for Colin's son, Seth is greatly required. Lift up these souls to the Lord with fervent prayer believing Jesus will do what only He can do in their lives. Avaraham Samadi - Baroda, India - Avaraham needs prayer for his heart and also for his diabetes and desires to be healed, strengthened and spiritually touched for the kingdom of God. Please pray for Avaraham and bless him and his household. Nothing is impossible with the Lord our God. Do not fret or have any anxiety about anything, but in every circumstance and in everything, by prayer and petition definite requests), with thanksgiving, continue to make your wants known to God.